The Solitary Sandpipers were never numerous and obviously preferred the open muddy shores of various types of pools. In „Birds of Brazil, The Pantanal & Cerrado of Central Brazil“ von J. Gwynne, R. Ridgely, G. Tudor und M. Argel and in „Die Vögel Europa, Nordafrikas und des Nahen Ostens“ von Peter Grant, Dan Zetterstrom, Lars Svenson and Killian Mullarney you read that Solitary Sandpipers breeds in woodlands across Alaska and Canada and winters as a migratory bird almost in the whole Latin America with a focus on the Amazon River basin. They prefer freshwater wetlands and is often found at sites, such as small pools, streams and rivers, marshes, wet meadows, flooded ditches, rice fields and small lakes surrounded by shrubby vegetation. These habitats are too restricted – as Wikipedia says – for other waders, which tend to like a clear all-round view. On the 2nd of January I even saw one individual of Solitary Sandpipers resting on the dry dam in the middle of the floated grassland. But – on the other hand – there were in total 6 individuals on 2 ponds on the 3rd of January. All feeding at the fringes of the pools between lower stands of grassy plants. The pattern – 1, 2 or sometime 3 individuals on a small patch of wetland per day – did not change over the whole period of time I spend on the farm. Riding with a horse on the 6th of January on that almost 9.000 hectares fazenda to a remote part (at least during rainy season remote area) to an oxbow lake over two and a half hours (one way) produced only 2 more sightings of in total 3 individuals. In so far, the impression is, that the patch what was observered on a daily bases along the passway could be regarded as representative. The attitude of defending feeding territories described in the “Handbook of the Birds of the World” Volume 3 could only observed in a few cases. Discussion: normally the Pantanal should act as one of the prime wintering grounds for waders. But the total number of wader species I saw was quite low. From the Transpantanaira I did not see one of the Nearctic waders and on other farms there is no observation neither during that time. One reason could be, that the preferred habitat is altered so fast by the rising waterlevel, that waders refrain from using this habitat more but becoming adapted to that. It might be, that Kaimans are a constant threat along the shores of pools thus I never saw Solitary Sandpipers (in contrast to a local wader, the Pied Lapwing (Vanellus cayanus), ) near Kaimans resting or searching for food. 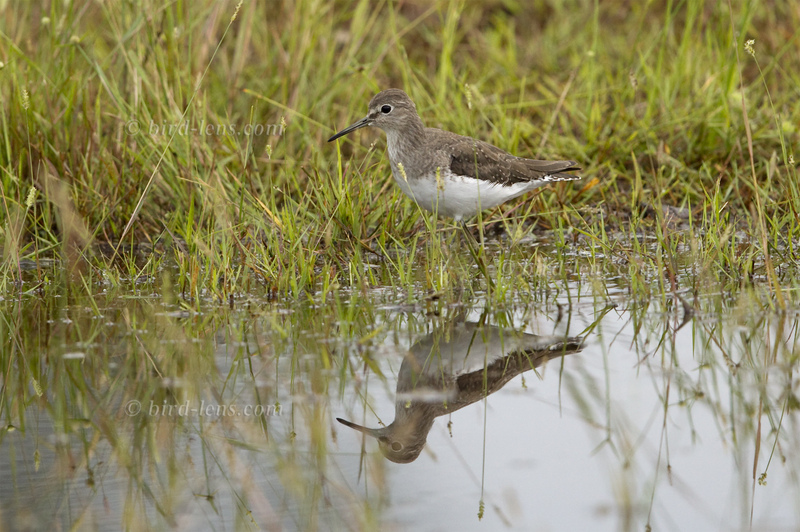 Additionally interesting is, that during the whole observation period there were no other Nearctic wader present. No, Upland Sandpiper (Bartramia longicauda), Greater Yellowlegs (Tringa melanoleuca), Lesser Yellowlegs (Tringa flavipes), Spotted Sandpiper (Actitis macularia), Semipalmated Sandpiper (Calidris pusilla), Western Sandpiper (Calidris mauri), Least Sandpiper (Calidris minutilla), White-rumped Sandpiper (Calidris fuscicollis), Baird’s Sandpiper (Calidris bairdii) or Pectoral Sandpiper (Calidris melanotos) which all could be possible from the perspective of habitat requirements to wintering grounds. Interesting in so far also, because for other bird families the dynamics were more than obvious. Sometimes with the rise of the waterlevel, sometimes without a obvious ecological trigger species appeared – and stayed – or disappeared again. The latter was true for the Little Blue Heron (Egretta caerulea) which appeared, but disappeared later, when the Snowy Egret (Egretta thula) showed up and stayed. This was also true to a number of south American flycatchers – probably intra-continental migrants like Myiarchus-Flycatcher. In the beginning only Dusky-capped Flycatcher (Myiarchus tuberculifer) and Short-crested Flycatcher (Myiarchus ferox) were present whereas with the rising water level Swainson’s Flycatcher (Myiarchus swainsoni) and particulary Brown-crested Flycatcher (Myiarchus tyrannulus) showed-up. There are more observations of Solitary Sandpiper (Tringa solitaria) from the typical migration time during October/ November. Maybe a hint, that the huge area of the Pantanal of course is an important stopover but due to the unconvienient water regime not a preferred wintering ground. The location of most observation is on the farm Pouso Alegre. This is a pousada which is very well situated 7 km away from the Transpantaneira. The location is only 33 km south of Pocone in the northern Pantanal. The whole pousada is a great nature-area with original landscape and extensive cattle ranching. The owner is present much of the time, and is a dedicated naturalist. If you are scientists or birders you will be pleased with the birding opportunities. Bird-lens is mainly a website to suit the growing demand for top shots of the species of the Western Palearctic. But of interest is the phenomenon of bird migration in general. Trips to tourist and non-tourist spots like Thailand or the Seychelles to capture images of rare migrating birds are part of the program and were already very successful. Just give me a message, if Bird-lens could serve you with images also outside the range of the Western Palearctic. Images of e.g. South America birds are well on stock, too. The nice images you find in in the gallery are only a first impression, what you might find in the gallery in the “Picture Shop” too. Just give bird-lens.com a message, if bird-lens.com could serve you with an image needed before other pictures are online.